Ugak's sister, Mog gra-Mogakh, is the innkeeper at Two Sisters Lodge in the city. If you ask Mog about Ugak, she will give you the following description: "My sister Ugak gra-Mogakh runs the Grateful Pass Stables. She's the quiet one. I'm the talker." 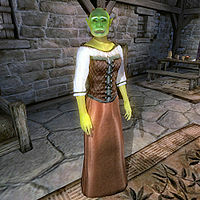 This might be true, but the Skingrad citizens still have a hard time telling them apart: "I saw Ugak gra-Mogakh earlier. At least, I think it was her. Perhaps it was her sister." and "Ugak has some good horses to sell. I sometimes can't tell her from her sister, though." Either way, everyone agrees that Ugak's horses are quality: "Well, if it was Ugak, you can be sure she had some good animals" and "The sisters are hard to tell apart. It's Ugak you'll want to find if you need a mount, though." Ugak has many unused responses to the Skingrad topic, none of which are voiced. Under normal circumstances she would say "Maybe you'd better talk to my sister, Mog gra-Mogakh. She runs the Two Sisters Lodge. She's the talker in the family." If you would've reached anything more than stage 0 of Deliver the Amulet but hadn't yet reached stage 100 of Dagon Shrine, than her response would've been "I heard there's trouble on the Gold Road, near Kvatch... if you're heading that way." If you were on a stage equal or more than 100 in Dagon Shrine but hadn't reached stage 100 of Spies, than she would instead say "Gates are opening outside the towns all over Cyrodiil. One opened right here in Skingrad. [pending implementation and flag for Skingrad gate status]" This text makes it apparent that these lines were removed before Skingrad's oblivion gate was finalized. The last variation would've played once you were on stage 1 of Allies for Bruma and had not yet reached stage 100 of Light the Dragonfires: "You're the one who closed the Skingrad gate? You must be... the Hero of Kvatch." This page was last modified on 2 December 2018, at 17:50.